Saving the love of her life could mean letting her inner darkness out to play. Beri O’Dell has to rip back into a hell dimension fast. To do that, she needs two things—the blood of an ancient, and a fix for her friend Blythe’s out-of-control magic. Blythe’s former mentor too, except the teacher’s lost her mind and joined a traveling band of singing witches. That’s not the only magical monkey on her back. Her lover Nikolos is imprisoned in a private hell, and a powerful being unleashed during Beri’s last battle likes it gluttonous new existence, and will kill to continue it. But Beri doesn’t give up, even if that means mining the darkness of her soul to set everything right…and to get Nikolos back in her arms. Warning: Sleazy ancients. Random fires. Nosy teenage hackers. Hints of off-screen torture. Battles with…Beri doesn’t know what. And one scary boyfriend who keeps inching toward insanity. 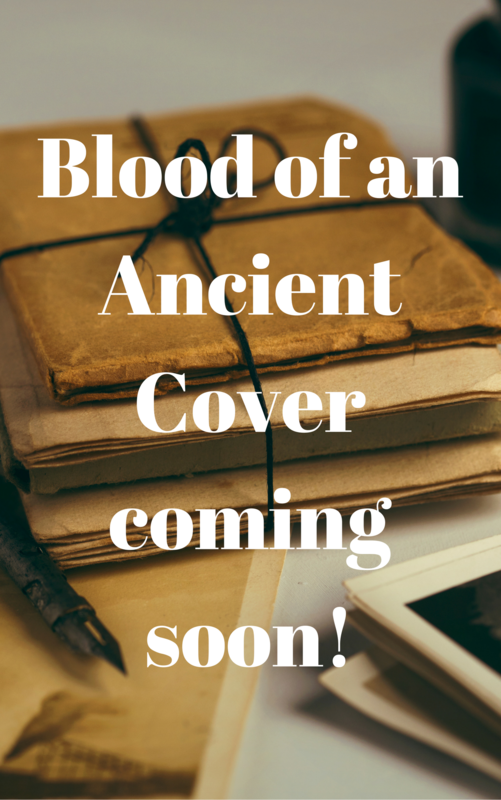 Blood of an Ancient is the second book in Rinda Elliott’s Beri O’Dell series and let me tell you, I liked this book as much as I did the first. And I liked that one a lot.–Rinda writes interesting twists when it comes to her paranormal creatures. You don’t encounter only your ‘usual’ beings, and I like that. Also unusual is how Rinda writes the Underworld. Very unique and tons of fun to read. Ms Elliot has once again delivered a well written, refreshing, beautiful tale that grabs you in its magical claws and takes you on a wild, zigzag journey filled with action, building relationships, capricious friends and the inexplicably deep bond Beri has for Nickolas. Her characters are endearing, funny, compassionate, eccentric and snarky but they come together so smoothly, you can’t help falling a little in love with them all. I really believe the strength of this book lies in its emotiveness as the characters just grab your heart and don’t let go. 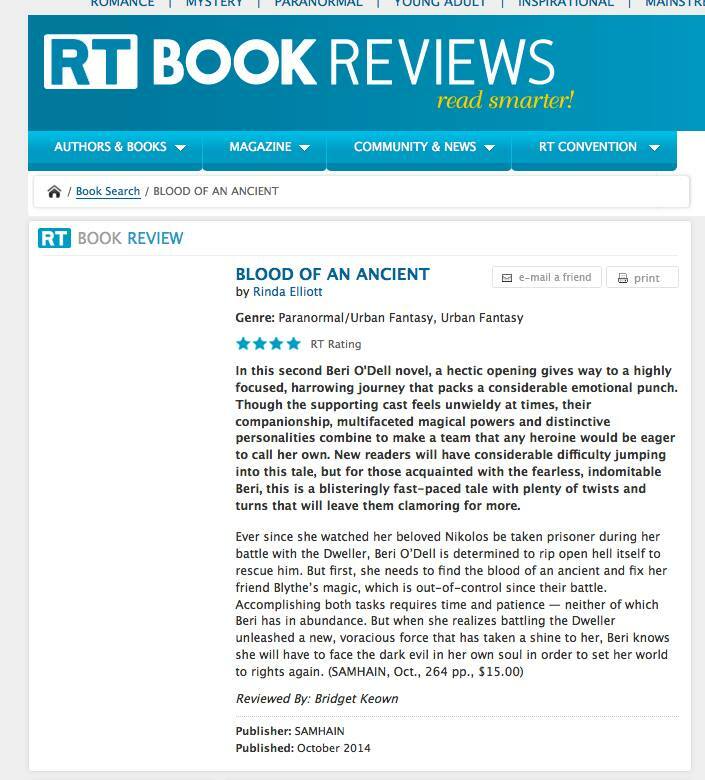 I really enjoyed Blood of an Ancient and feel like we have just scratched the surface on the potential for this series – its urban fantasy but with slightly more romantic elements which only enhance the story further for me. All the characters, old and new, combined together with a page turning plot helped move this series on to my favourite’s shelf to be returned to again and again. There is so much more I want to say about this book but I’ll just go with DON’T MISS OUT ON THIS SERIES! This time around, we get to see a slightly more sadistic side of Beri, and you know what? I kind of loved it. She’s so conscious all the time of her strength that seeing her get to let loose with it against people who deserve it, over and over again, was pretty great. She feels like less of a freak and she’s got more confidence now, and the hacker kids, led by Rory, help build it up. They think what she can do is cool, and they’re not afraid to let her know it.